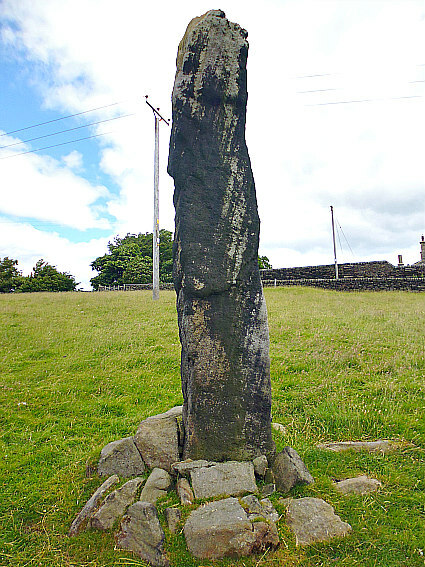 Tall standing stone at the hamlet of Stones, near Todmorden. OS grid reference: SD 9252 2359. There are three standing stones at the hamlet of Stones near Todmorden, West York-shire, but in this case they seem to be reasonably “modern” in date. This off-the-beaten-track hamlet with the name “stones” is a curious one. It seems to be ‘in another time or realm of its own’, but an idyllic one. It lies just south-west of the imposing Victorian ediface Dobroyd Castle, once home to the industrious Fielden family of Todmorden. At least one of the standing stones was erected in the early 19th century, while the other two were put up around the same time or a bit later – perhaps in more recent times? And there is a fourth stone but this is recumbent and now lies in front of a well. To reach these standing stones it is best to drive into Bacup town centre, then the A681 (Bacup Road) through Sharneyford, and at Cloughfoot turn left onto the steep Sour Hall Road, then turn right onto Parkin Lane which soon becomes Stones Lane. The tallest of the stones is in front of you on the left-hand side. It will, however, be difficult to find a parking place on this narrow lane and difficult to turn around again! Stone No 1 viewed from a different angle. The tallest of the three standing stones known as (No 1) is said to be 12 feet high and can be found in a farmer’s field beside Stones Lane and just to the west of Stones Farm. It is a hefty pillar of grey-black millstone grit from a local quarry that was obviously long exposed to the industrial chimney smoke of Todmorden in days gone by. We don’t really know when the gigantic stone was set up, and whether this is its original position, though it looks to be well supported at its base by a number of sturdy stones. It may have been erected after the Battle of Waterloo in 1812, rather like the other standing stone over to the north on the hillock called Centre Hill, or maybe this stone was placed here following another, perhaps, more recent battles like those of The Great War 1914-18. This seems more likely as there is evidence saying it was placed here in 1921, but other than that, we may never really know with any certainty. 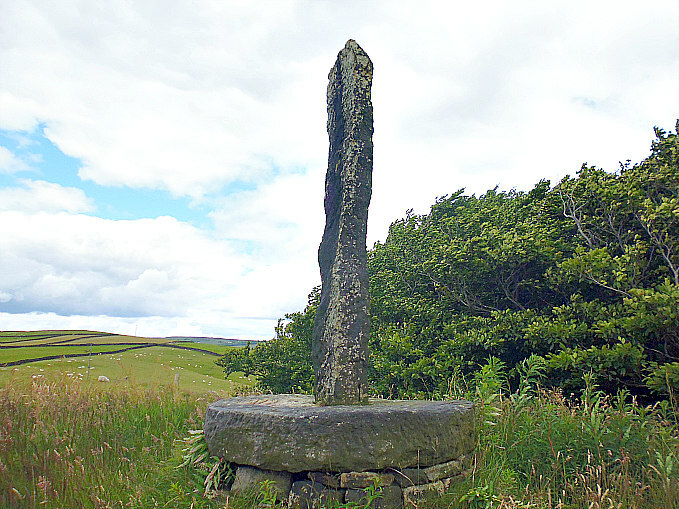 It is the fourth tallest standing stone in Yorkshire (Billingsley, John, ‘Folk Tales from Calderdale – Volume 1’. 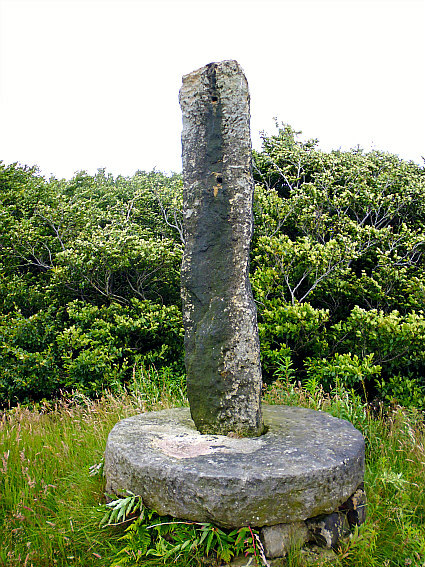 Standing stone No 2 on Centre Hill. Stone No 2 on Centre Hill (from a different angle). The slightly shorter and thinner standing stone known as (No 2) stands atop a grassy hillock called Centre Hill (OS grid ref: SD 9254 2369) which is partly surrounded by a wooded area at the south-side and, just below that, a private residence called Model Farm. It is located some 95m north-east of, but more or less, in the same field as Stone No 1, although there is a low wall in between this and the little hillock. This particular stone is held in place through the central hole of a large millstone – which is in turn supported below that on some other flat stones arranged in an equally circular fashion. We do know, however, with some sort of certainty that this stone was brought to its present position after 1812 and erected to commemorate ‘The Battle of Waterloo’. Centre Hill was originally the site of a beacon, according to author Paul Bennett, The Northern Antiquarian. It looks as if this standing stone has at some point been used as a gatepost! Stone No 3 at Stones Lane, near Todmorden. Stone No 4 lies in front of the well near Stones Lane. 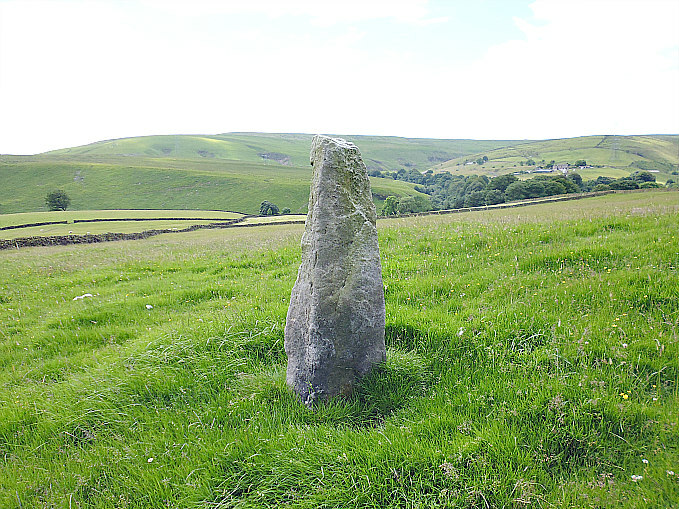 Standing stone No 3 is located at the east side of a farmer’s field some 330m to the north-west along Stones Lane (OS grid ref: SD 9225 2380). It stands at just 4½ feet high and is a thin pillar compared to the other two stones, but it is quite a nice little standing stone. We do not know when this stone was placed here though it looks as if it might have been here for a much longer period of time. A little to the south of this stone, close to the wall, there is a well that has a ‘good’ constant supply of fairly clear water that comes down from the low hillside above. At the front of the well there is a 5 foot long, flat recumbent stone; this is considered to be the former standing stone No 4. 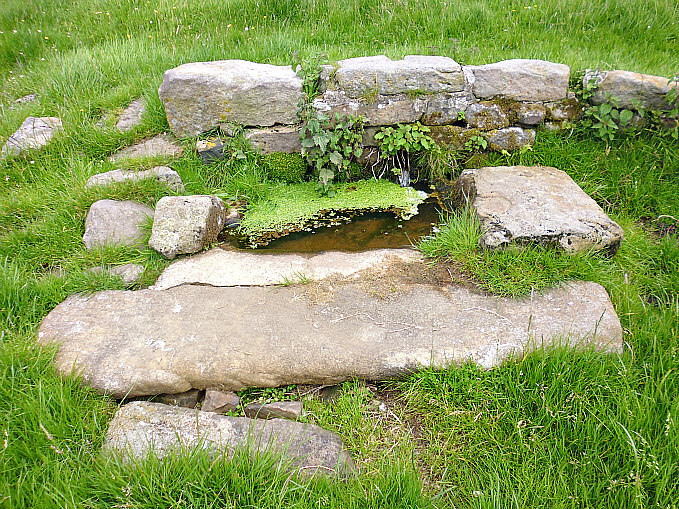 The spring apparently began to flow or re-emerge when the stone was being dug-up, according to Paul Bennett, The Northern Antiquarian. However, this well is not marked on recent OS maps nor are any of the standing stones for that matter! I think that in the recent past there were many other standing stones here but unfor-tunately these have been dug up and moved elsewhere in the locality, many being broken up and put to use in nearby walls. The standing stones can be photographed from Stones Lane, but a word of caution here: It is ‘unwise to climb over the walls’ to look at these standing stones. There are gates, however, and if the farmer is driving along the lane in his tractor he might open these gates to allow access for one to get up closer! Billingsley, John, Folk Tales from Calderdale, Northern Earth, Mytholmroyd, Hebden Bridge, West Yorkshire, 2008. 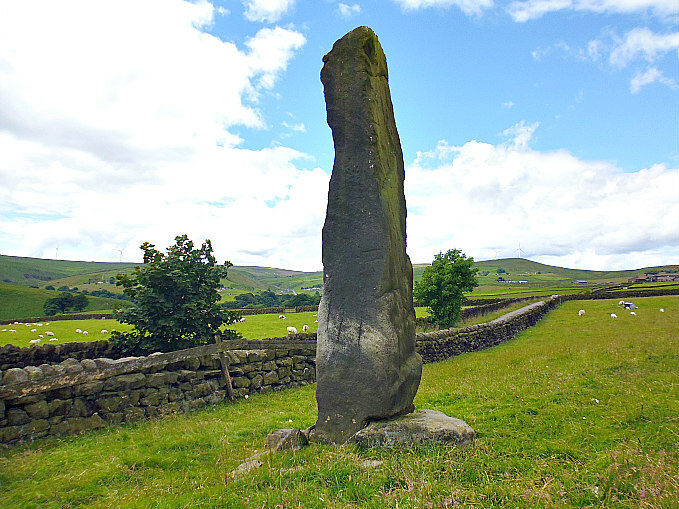 Categories: Standing Stones | Tags: Standing Stones at Stones near Todmorden in West Yorkshire | Permalink.